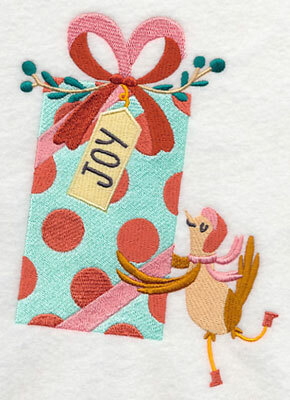 Start your seasonal stitching early with new Christmas in July designs! 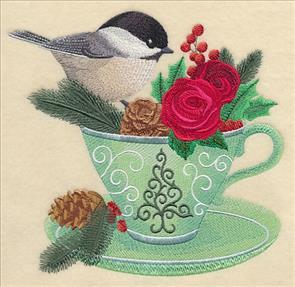 Add a sophisticated style to your holiday projects with elegant birds on teacups, or chic watercolor Christmas designs. 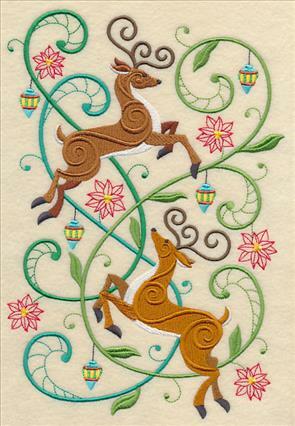 Stockings, pillows, and tree skirts get a fun and festive update with animals carrying presents, or reindeer potpourri designs. Plus, new in-the-hoop ornaments, a lace poinsettia, and luminary silhouettes will help you get a jumpstart on your holiday crafting. 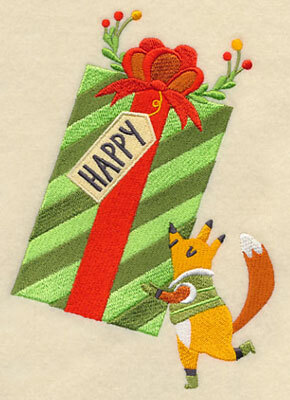 Scroll down the page to see these fa-la-la-fabulous designs! 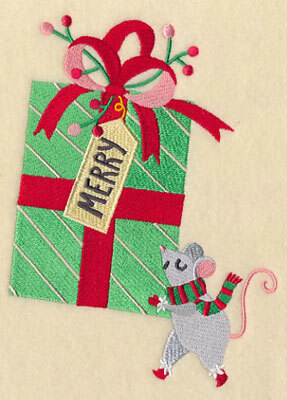 Stitch this holiday design on a tote to corral decorations or wrapping supplies. 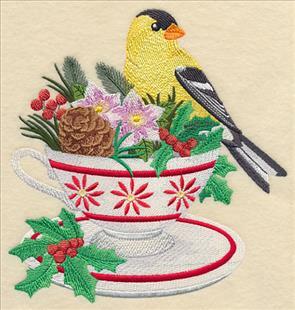 Add a holly jolly look to your embroidery with pretty birds perched on teacups. Each of the cups are overflowing with holiday greenery, ornaments, and other festive elements. 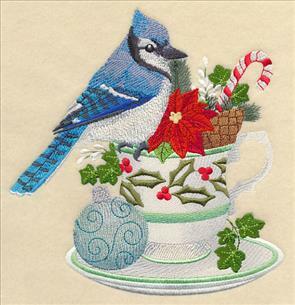 6.90" x 7.82" and 5.86" x 6.61" and 4.85" x 5.50"
Stitch the classic winter birds on stockings or pillow covers, or make a set of framed pieces to deck your halls for the holidays! 6.89" x 7.17" and 5.86" x 6.09" and 4.85" x 5.05"
Stitch the magic of Santa's midnight ride on pillows, tote bags, quilts, and more with this whimsical design. 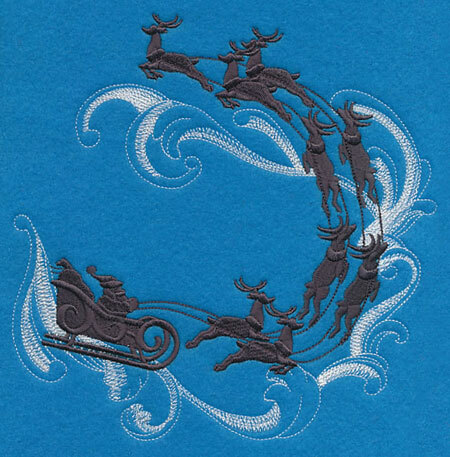 Baroque flourishes add an enchanting look to the silhouette of Santa and his reindeer. 7.73" x 7.80" and 6.83" x 6.90" and 5.84" x 5.91"
Deck your halls with the signs of the season with these stunning designs. 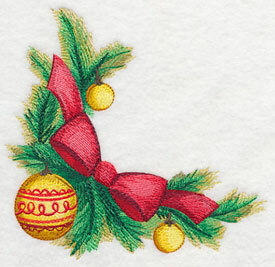 Classic Christmas elements, such as a wreath filled with ornaments, or a Christmas tree, have been stitched in the beautiful watercolor style, and are gorgeous additions to any embroidery project! 7.81" x 7.67" and 6.99" x 6.89" and 5.92" x 5.86" and 4.92" x 4.87"
The tradition of Christmas trees began in the Celtic culture, but is now a holiday staple all over the world. 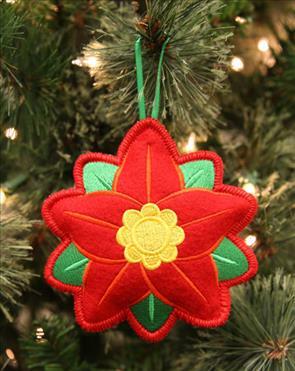 Stitch the Yuletide symbol on pillows, tote bags, and quilts to spread the spirit of the season! 6.88" x 9.52" and 5.84" x 8.10" and 5.26" x 7.29" and 4.80" x 6.71"
Wish loved ones a "Merry Christmas" with an evergreen wreath adorned with ornaments, holly and berries, and holiday bells. 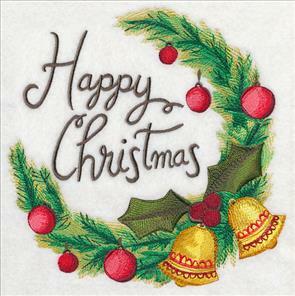 An alternative "Happy Christmas" wreath has also been created in this style. 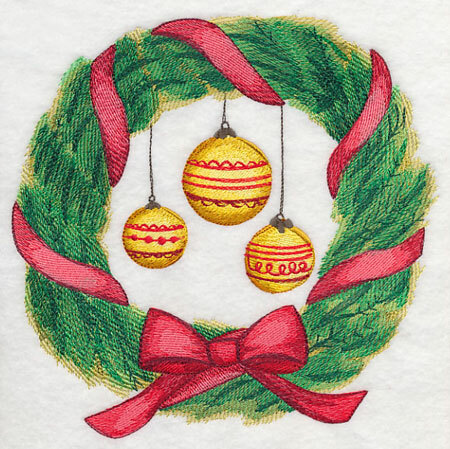 7.77" x 7.76" and 6.88" x 6.88"
5.86" x 5.84" and 4.85" x 4.84"
Use this watercolor border in conjunction with the wreaths and tree above, or stitch on it's own for an elegant look. 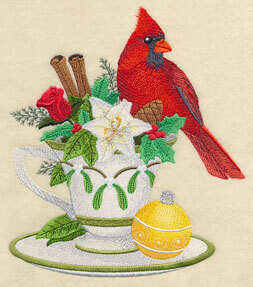 Great for adorning tree skirts, tablecloths, and pillows. 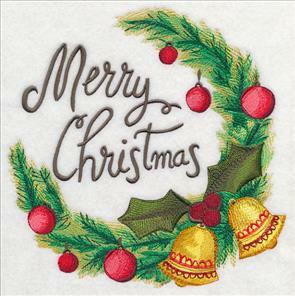 11.71" x 3.27" and 9.34" x 2.62" and 7.78" x 2.19" and 6.00" x 2.00"
The sophisticated style of these Christmas embroidery designs make them the perfect fit for a chic, contemporary holiday season. Great for any project! Get these Christmas watercolor designs using the links above, or get them all in a design pack! 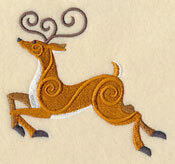 Celebrate Dasher, Dancer, Prancer, and the whole gang with these fanciful reindeer designs! 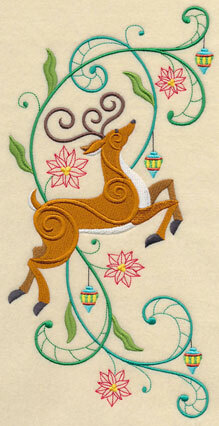 Elegant reindeer amongst swirls, poinsettias, ornaments, and more are a colorful way to stitch for the season. 6.90" x 9.87" and 5.85" x 8.37"
5.86" x 11.75" and 4.70" x 9.41"
3.91" x 7.81" and 3.43" x 6.86"
These gorgeous designs are terrific additions to tea towels, tote bags, placemats, and more. 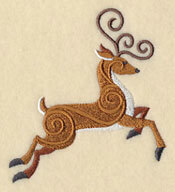 Whip up a set of table linens featuring the whimsical reindeer, or use them all on a quilt! 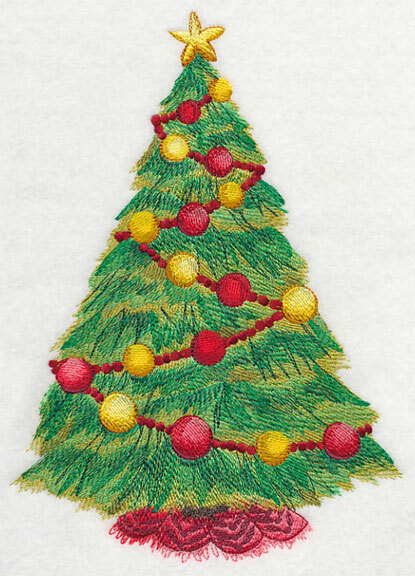 To get inspired to start stitching for Christmas, see all of our holiday projects here. 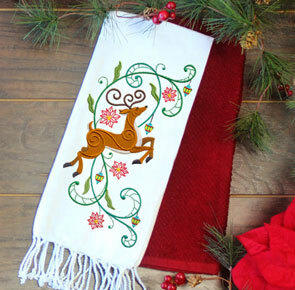 A beautiful border design is the perfect way to embroider Christmas magic on placemats, pillowcases, table runners, and more. 11.75" x 5.38" and 9.41" x 4.31" and 7.81" x 3.57" and 6.00" x 2.93"
Use this brilliant corner and single reindeer designs to accent a pocket, napkin, or other small area. For more ideas when working with corner designs, watch this inspiring video! 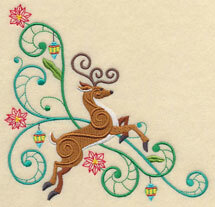 3.85" x 3.69" and 2.51" x 2.41"
Get these fanciful reindeer designs using the links above, or get them all in a design pack! Adorable animals wrapped in their winter hats, scarves, and mittens carry oversized presents to friends and family in these too-cute Christmas designs. 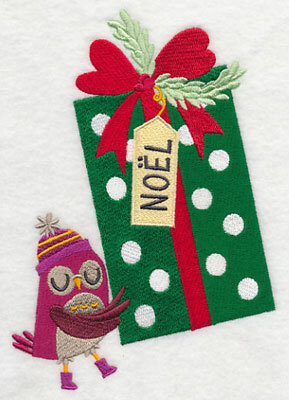 Each of the gifts bears a tag of holiday wishes, such as the "Noel" and "Merry" below. 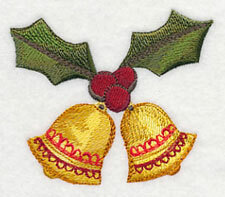 4.84" x 6.83" and 2.74" x 3.85"
Stitch these charming designs on stockings, tree skirts, or other Christmas projects. They're especially brilliant on kids' gear! 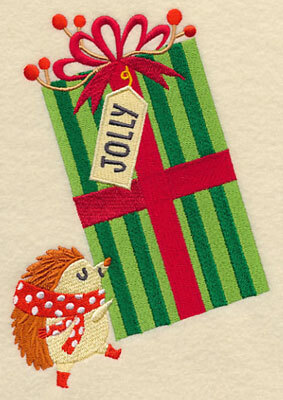 4.84" x 6.85" and 2.72" x 3.86"
A hedgehog and winter bird round out the collection of fa-la-la festive friends. 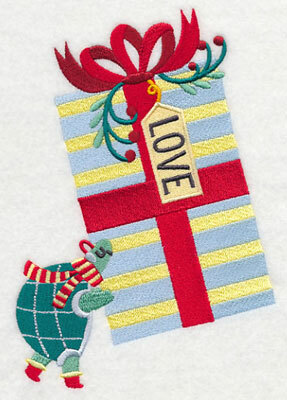 Stitch on reusable gift wrap, including a fabric gift bag, bottle wrap, or felt bag. 4.84" x 6.86" and 2.73" x 3.87"
Get these adorable animals and their gifts using the links above, or get them all in a design pack. 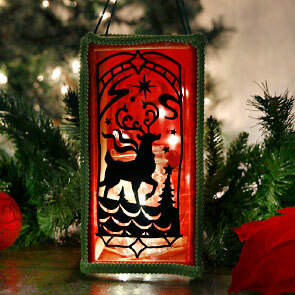 Silhouette panels depicting classic Christmas scenes are fabulous used on the lantern above, and are also terrific as a series of wall hangings, on wall dividers, or as framed panels. 5.00" x 11.75" and 4.00" x 9.41"
3.32" x 7.81" and 2.92" x 6.86"
Light the way for Santa and his reindeer on December 24 with a glowing seasonal luminary. 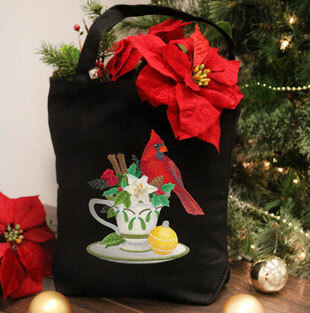 The warm, cozy Christmas scenes stitched on organza give a soft, glowing appeal to the lantern. See how to transform the silhouette panels below into this fabulous luminary. Here a reindeer stands in profile in the North Pole; a holiday tree is trimmed with ornaments and gifts. Change the colors to fit your holiday decorating scheme! 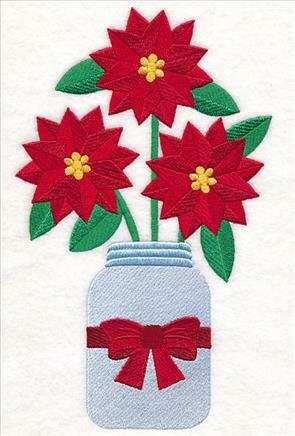 Delicate lace petals come together to create a beautiful poinsettia. 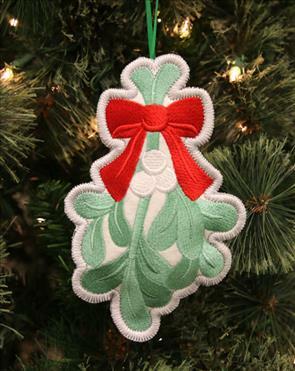 Use as a decoration at your dining table, or to adorn gifts, trim your tree, and so much more! 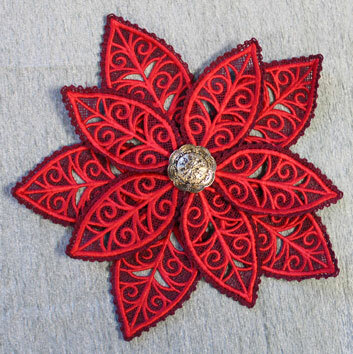 Find the helpful instructions for assembling this lace poinsettia here. 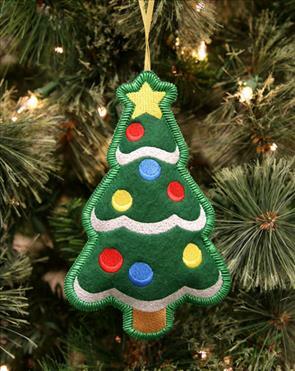 4.65" x 2.42" and 3.65" x 1.90"
Classic and colorful stuffed ornaments add a bright look to any Christmas tree! The edges are finished with an heirloom, or E-stitch for a crafty look. 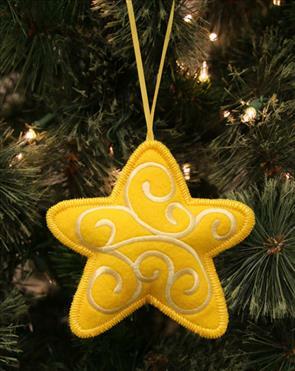 See how to make these ornaments in our new video, or find the written tutorial here. 4.88" x 5.03" and 3.76" x 3.88"
A swig of mistletoe can pull double duty hung in a doorway for sweethearts to see. 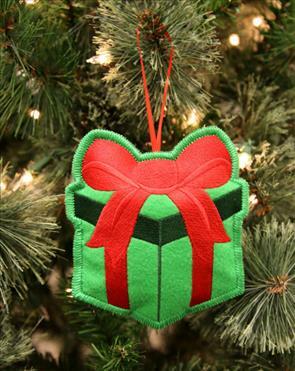 Attach this Christmas gift ornament to presents for extra festive flair. 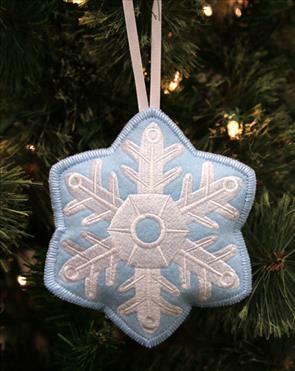 4.86" x 5.36" and 3.50" x 3.86"
Finish the collection of stuffed ornaments with a star and snowflake. They're sure to add an elegant look to any Christmas tree -- make a set for yourself, or share with family and friends! This new video shows the steps for assembling these festive ornaments. Or, get the written instructions in this project tutorial. 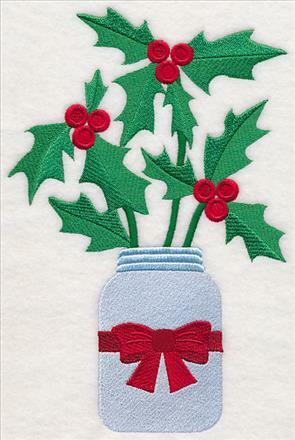 4.88" x 5.56" and 3.42" x 3.89"
Carolyn sent in an email requesting mason jars filled with festive foliage, such as poinsettias and holly and berries. These delightful bouquets have been created in the primitive style, and are fabulous on kitchen towels, placemats, and pillows. 5.69" x 9.38" and 4.73" x 7.80"
5.84" x 8.90" and 5.11" x 7.80"
4.50" x 6.85" and 2.55" x 3.89"